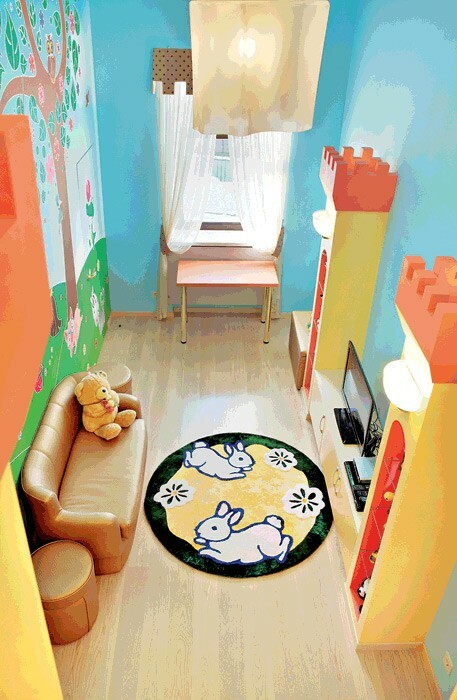 A well-thought-out layout of the house where two little girls are growing up let the interior designer to give separate rooms for bedtime and games. 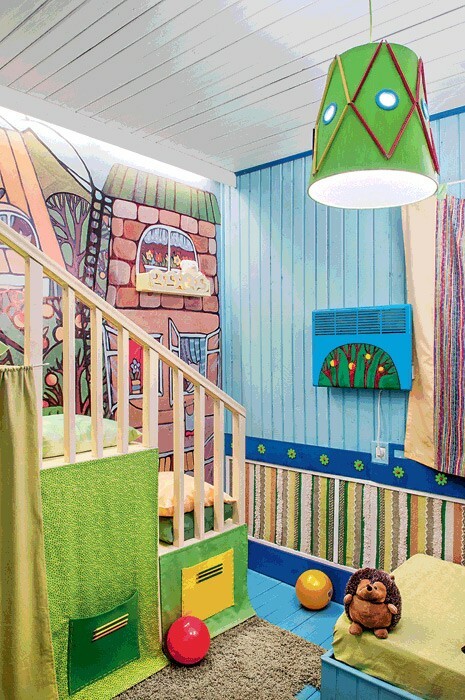 The space allocated for the play zone had high ceilings, and the architect decided to make any kid’s dream about having a mezzanine floor come true. There a young mistress may have some privacy playing alone or invite her friends for sharing secrets and playing girlish games. 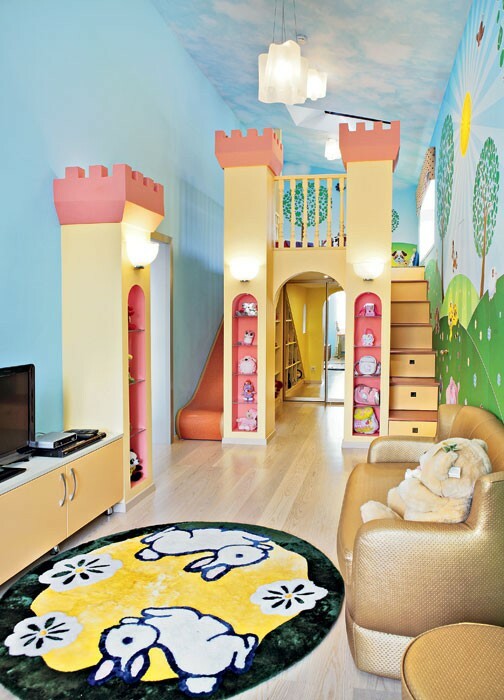 The mezzanine construction was custom-designed as a magical castle, where you can get to by a staircase. Underneath there is a roomy walk-in closet concealed behind a glass door and a storage room for keeping kids’ stuff. 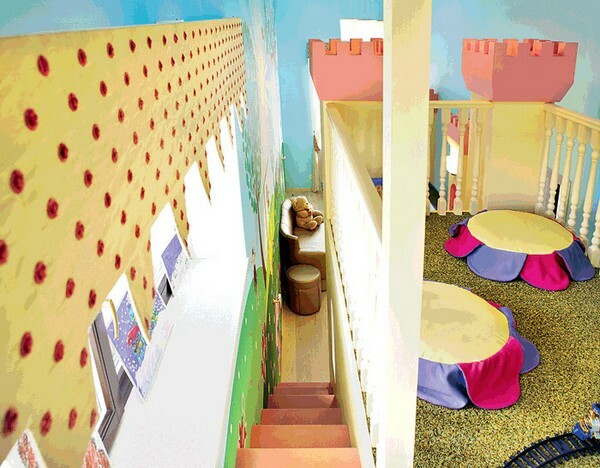 The other side of the castle features the funniest part of the mezzanine – a slide for fast descents. To make the riding safer, the parents put special big pillows with anti-slip surface at the bottom. As you have already guessed, the most favorite character of the room’s mistress is a small white kitten Kitty. 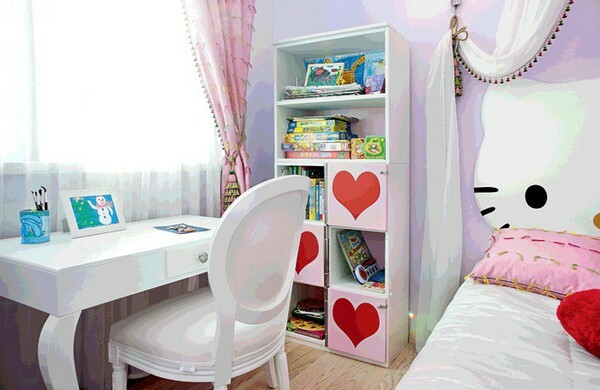 The author of the project felt free to use its image in furnishing: a bed, a writing desk, a dressing table, a chair and a wardrobe feature the face of this Japanese anime character. Light-colored furniture set appeared to be perfect for a small room with an area of 9 sq. 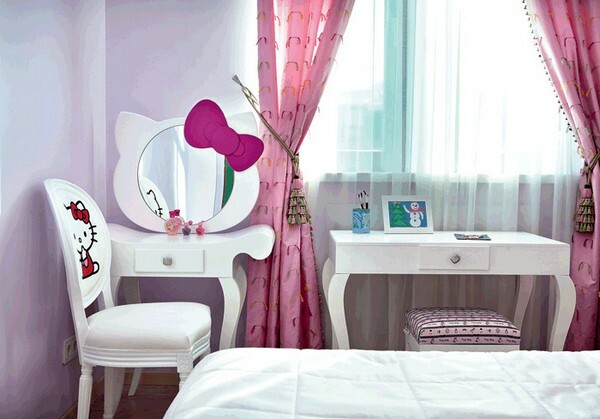 m. A traditional girl’s bedroom color – pink – was a little bit cooled down by cold lilac wall paint. And to bring some bright accents to the palette, the decorator used several red specks. 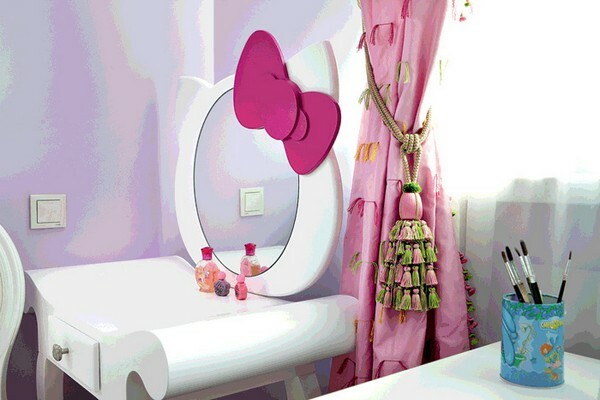 The color was inspired by a famous ribbon of the kitten. 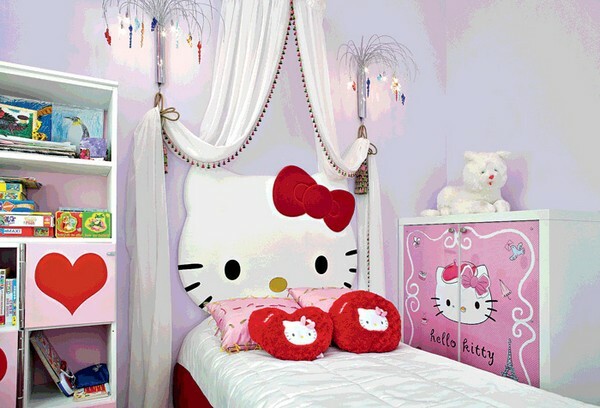 To couple it the decorator added a custom-made bedspread, decorative pillows and a heart-shaped décor of the shelving unit. 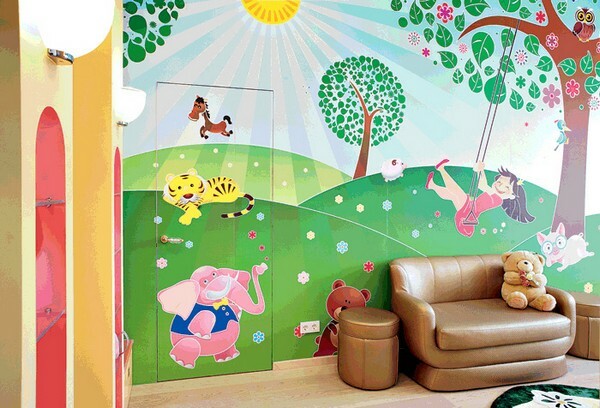 The third of today girl’s playrooms is situated in a summer house of very hospitable masters, who invite a few families with small kids to spend their holidays here. Earlier there was no decent place here for kids’ games and sleep. The room, in which they had to spend time, was very cold and dull. 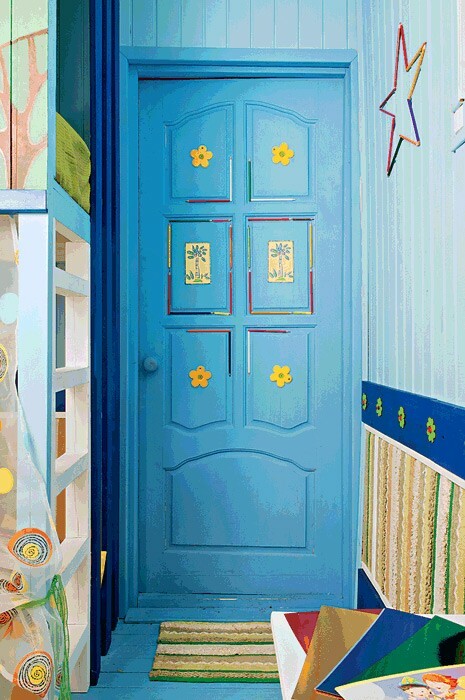 That’s why the designer had her heart set on bright and cheerful color palette. 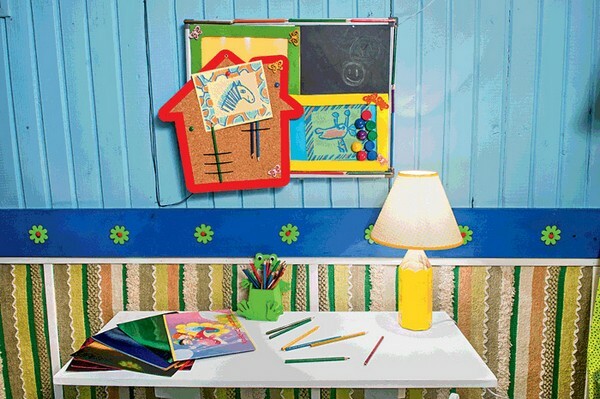 As a concept of the future interior chosen was the favorite tool of childhood creativity – a set of colored pencils. Thus the ceiling was painted white, the walls and flooring were made light-blue, and the closets and balustrade – pastel yellow. 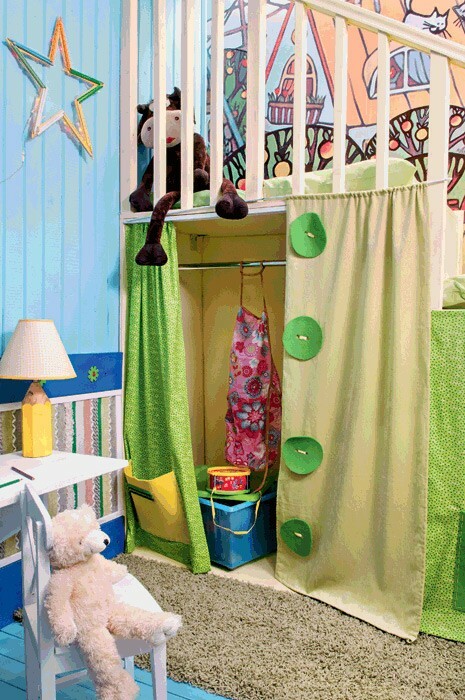 The most attractive spot of the room is a birdhouse. 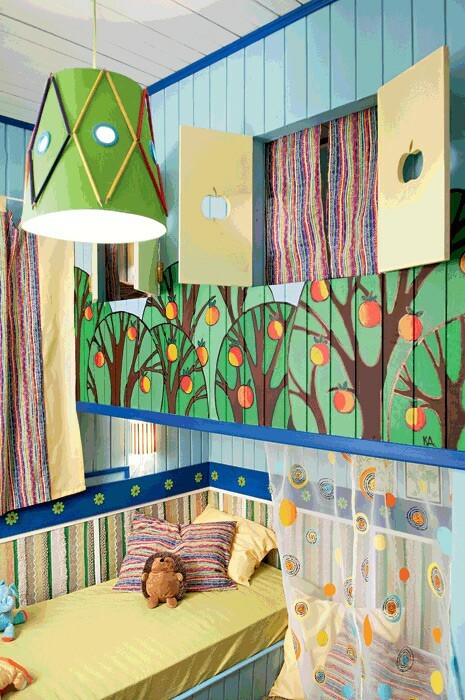 When the sun is up, it becomes a playroom, and in the nighttime turns into a cozy sleeping place.